Hello all, for my first Valkyries Webzine’s review, i will tell you about the first album of Irish Moutarde, Celtic Punk Rock of Québec. The Band annonces on their website « a debut album full of energy that fulfills Irish Moutarde’s promise that no matter the day you’ll listen to the album, it’ll always be St.Patrick’s Day! ». Everyone take a Guinness and bring a scarf, we are travelling to Quebec, to check our Celtic Music ! What is sure with the first opus, winter is not coming, it’s very catchy, as soon as the first song begins : The Black Mill. This album is composed of many drinking songs, or irish / scottish traditionnals songs. The band made a humoristic song about an alternative life of Jesus, called « I Heard Jesus Was ». An other amazing song, is Olaf, which tells in French (why not ! ), the meeting of the band and their green giraffe with yellow spots, that became their mascot, during a live on St Patrick’s Day ! In a musical point of view, we have here a wide line up of 7 musicians, with many multi instrumentalists, it’s very pleasant to listen on this album many celtics instuments like bagpipes, tin whistle or celtic harp. They also use other instuments that are rarer in Punk Rock composition like accordion, banjo and others that unfortunaly I didn’t manage to identify. Musically too, the melody is accompanied by a typically Punk rhythm section, with a good speed. Power chords. Snare are very present, to the point that some songs sound more Metal. We also note the presence of lot of breaks in the chorus, with all singing before return with more power ! 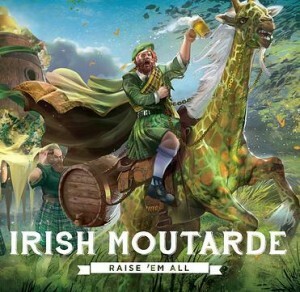 I- who was expecting an nth Dropkicks-like album, I have a spiteful gossip, Irish Moutarde is a band that will grow up in the Celtic Punk Rock stage, and about their promise to put St Patrick’s Day on a CD, I am truly convinced of it, promise held! If the guys (and girl) come to France, I would be happy to pay you a beer ! Lien du groupe : Facebook, Site Officiel, Bandcamp.